If you’ve ever woken up on a Saturday and thought, ‘you know what, I need something more than overpriced brunch this weekend – what I really need is a chance to piece together the bones of an enormous bottle-nosed whale’, then, my friend, this is your moment. 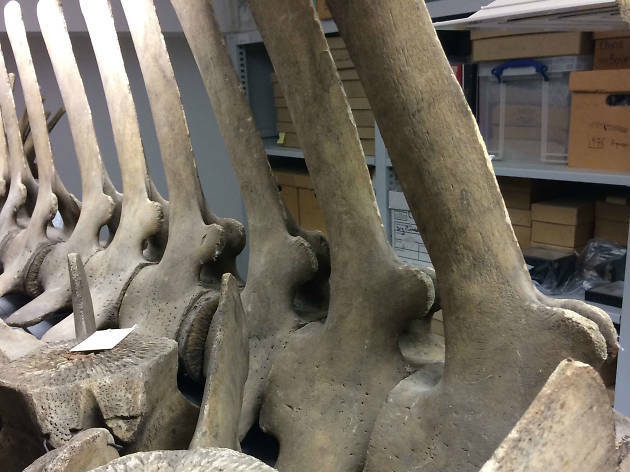 The Grant Museum of Zoology are inviting Londoners to help rebuild its largest specimen: an eight-metre, 157-year-old whale skeleton. It’s the same breed as ‘Whaley’, the unlucky mammal who got stuck in the Thames back in 2006. Up until now, the bones have been scattered across several locations, with only the skull on display. Drop into the museum to take part in the ‘Whale Weekender’ between noon and 4pm this Saturday and Sunday, and you can help conservators reconstruct it from scratch. This is no Fisher Price puzzle: eight-metre whales have a shitload of bones, and unless you just-so-happen to be an expert in the intricacies of whale anatomy, it’s going to be quite a challenge. Thankfully, there will be a plastic human skeleton on hand to help you figure out what goes where (they’re similar, right?!). Hardly anyone will know the arse from the lumbar bone, so we predict humerus scenes of Londoners running around screaming ‘who’s got the phalange?!’. It’s not all vertebrae-assembling: 157 years’ worth of dust has accumulated on those bones, and it can’t be seen by the public until it’s all been wiped away. Visitors will be given special ‘smoke sponges’ and putty to aid the over-whale-ming task of getting that specimen squeaky clean. London needs an oversized whale, guys. Don’t blow it. The Whale Weekender will take place on Sat Jul 8 and Sun Jul 9 between noon and 4pm at The Grant Museum of Zoology; no need to book, just turn up. Can’t make it? Pay a visit to London’s weirdest museums instead.